June 06, Colombo: Two top officials of the British government arrived in Sri Lanka earlier Monday met with Prime Minister Ranil Wickremesinghe and the Opposition Leader R. Sampanthan in Colombo today. Permanent Under-Secretary at the Foreign & Commonwealth Office Simon McDonald and Permanent Under-Secretary at the UK Department for International Development Mark Lowcock met with Prime Minister Wickremesinghe and discussed progress on reconciliation, anti-corruption and UK assistance for reconciliation and reform, the British High Commission in Colombo said. 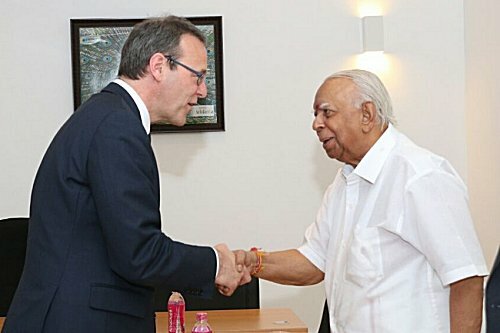 The UK government officials also met with Leader of the Opposition and the Tamil National Alliance MP R. Sampanthan to discuss challenges facing the Tamil community in Sri Lanka, and progress on reconciliation. Meeting with Minister of Law and Order & Southern Development Sagala Ratnayake and Acting Inspector General of Police (IGP) SDIG Wickmarasinghe, the visiting officials focused the discussions efforts to reform the Sri Lanka Police Service to improve local safety, security and post-conflict stability. 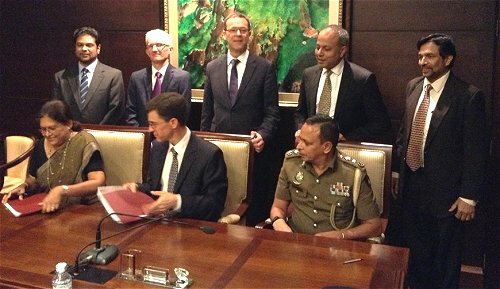 Following the meeting British High Commissioner to Sri Lanka James Dauris signed a contract with The Asia Foundation to continue UK funded community policing initiatives in Sri Lanka. Mr. McDonald, the most senior UK diplomat and Mr. Lowcock also met with Director General of the Commission for the Investigation of Allegations of Bribery or Corruption Mrs Dilrukshi Dias Wickramasinghe to discuss Sri Lankan efforts to counter corruption. The UK is supporting efforts of the Sri Lankan government to investigate allegations of bribery and corruption, the High Commission said. Thus far, efforts have included officers from the Serious Fraud Office (SFO) in the UK working on capacity building and training of Sri Lankan investigators and prosecutors.